The first two days of my Northern California wine tour were in the northern part of the Sierra Foothills, but the final Monday portion of my trip would be entirely in Tehama County, an area farther north that’s quite distant from other wine regions in the state. I’d arranged three visits for this day, and thought I might be able to squeeze in another drop-in stop at a tasting room though it turned out that I didn’t have time for that. The last visit I had scheduled for that Monday was to a winery that’s producing some remarkable wines in an unlikely location. But before that, I drove out to visit two vintners in an obscure but fascinating California wine region that deserves a brief introduction. 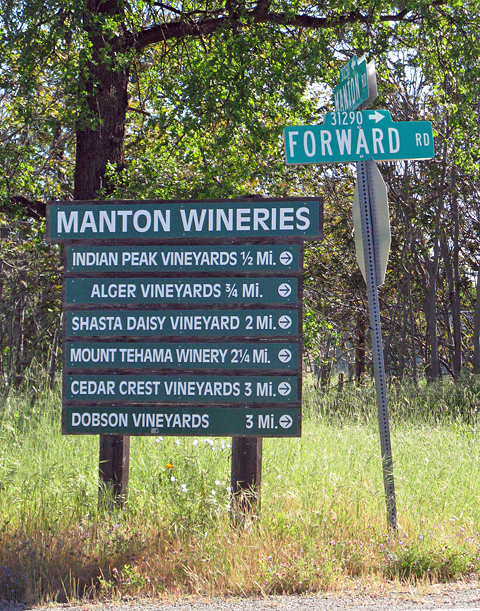 Manton Valley is a little-known California growing region located in the northeastern part of the state – it’s one of the state’s northernmost designated AVAs. Approved in August 2014, it’s a fairly small AVA, with roughly 200 acres of winegrapes planted at about ten commercial vineyards, and a handful of bonded wineries. Mark Livingston of Cedar Crest Vineyard, who I would be visiting, did the legwork for preparing the petition to the TTB that created the Manton Valley AVA. The vineyards in the area range in elevation from around 2,000 to 3,500 feet, with mostly volcanic soil – a product of the nearby volcanoes at the southern end of the Cascade Range, notably Mount Shasta and Lassen Peak. 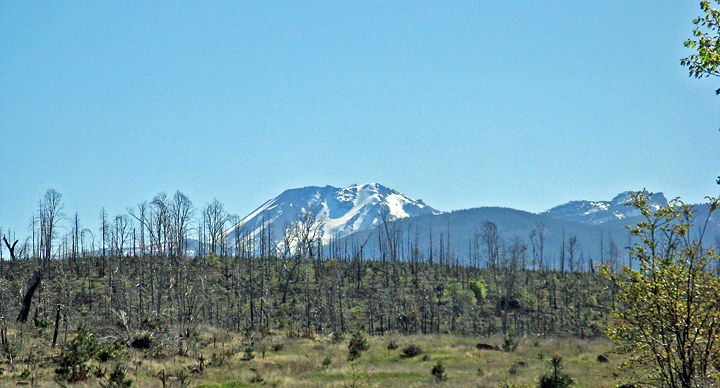 10,460-foot Lassen Peak, just 15 miles east of Manton Valley, last erupted only a hundred years ago. The climate is considered Type II-III, tending more toward III – generally a moderate climate for winegrapes that’s not especially cool (except in some spots) but not really hot either. Mark Livingston told me that there are generally a few days over 100 degrees most years, but it cools off a lot at night due to the elevation. The degree-days are similar to that of St. Helena in Napa Valley. Known in the past for logging and lumber production and later for its pear and apple orchards, the first modern winegrape plantings in Manton Valley came in 1971-72, when Jerry Dobson planted around 90 acres in the red soil of the valley. From what I was told by Jim Livingston (Mark’s father) at Cedar Crest and John Alger of Alger Vineyard, most of the original plantings at Dobson Vineyard were Syrah – this would have been one of the earliest if not the very earliest modern Syrah planting in California. Dobson was specifically looking for a spot to plant Rhône varieties in the area east of Redding and was helped by a friend from UC Davis to find a good location, which turned out to be Manton Valley. The Syrah at Dobson Vineyard was mostly (perhaps entirely) grafted to other varieties many years ago – mainly Chardonnay. This fruit was sold for many years to the Fetzer family. Also around 1971-72, Petite Sirah vines were planted at what is now Alger Vineyard, and many of these old vines remain and are still producing. Vineyards in Manton Valley are currently planted largely to Bordeaux varieties, as well as Rhônes, Chardonnay, with a little Pinot Noir, Riesling, and Gewürztraminer in cooler spots, plus a few other varieties. A good deal of the fruit is sold to vintners from outside the region. The first small wineries in Manton Valley were established in the early 2000s. All but one of the current wineries are located along Forward Road east of the small town of Manton, a fairly easy drive from the cities of Redding and Red Bluff in the northern end of Sacramento Valley to the west. Even with visitors from those places, as well as from the city of Chico to the south, the remoteness of the area has proved to be a struggle for the Manton Valley wineries, with a couple of them closing in the past few years. Interest in Manton Valley fruit from vintners outside the area seems to be growing, though, and perhaps this may help lead to a resurgence in the local wine scene as well. I’d first heard of vineyards in Manton Valley a few years ago from a friend, vintner Martha Stoumen, who had worked with Chardonnay from the valley and made a few very nice wines from it. Then in 2017, Bryan Harrington – who I work with part-time – was able to buy some Cabernet Franc fruit from Cedar Crest Vineyards. The higher altitude volcanic soil of the region intrigued him, not only for the Cab Franc but potentially as a spot where other grape varieties could thrive. So with all this in mind, I thought this would be a perfect opportunity to visit Manton Valley. I started out from my motel in Corning around 8am, and drove north on Interstate 5 to Red Bluff, where I exited the freeway and made my way onto two-lane Highway 36, which heads east toward Lassen National Park. After a few miles, I turned off onto Manton Road for the remaining drive northeast to Manton Valley. With little traffic to bother me, I was able to enjoy the view of Mount Shasta, one of California’s highest peaks, 80 miles to the north, as well as of Lassen Peak as I approached it from the west. Outcroppings of volcanic rock were everywhere along the route. It was a warm, sunny morning as I drove slowly through Manton, where the Manton Corners general store and saloon marks the center of the small town. I continued east along Forward Road, where the heart of Manton Valley wine region is located. As I proceeded, the road climbed higher, into a forested landscape. Finding myself with a few minutes to spare before my first appointment of the day at Cedar Crest Vineyards, I kept driving past the winery sign along the road to see what lay beyond. Climbing steadily higher, I soon drove out from the forest and up along hillsides that had obviously been burned during a recent wildfire, probably one that came through the area in 2012. The time had come to turn around and head back down the road to Cedar Crest. I drove up to a cluster of small buildings near the edge of the vineyard, where I found winemaker Mark Livingston cleaning up from a winery event that had been held over the weekend. Mark’s parents Jim and Corey bought the 76-acre property in 2004, with the intention of retiring there (Jim had been an electrical engineer) and making a little wine as a hobby. As is sometimes the case, a winemaking hobby turns into a business, and in 2007 they planted a vineyard and built a small winery building, and the winery was bonded in 2009. Mark greeted me, and we walked out into the vineyard. There are four acres planted, to Viognier, Cabernet Sauvignon, Cabernet Franc, and Petite Sirah. Cuttings for the vines came mainly from Foundation Plant Services at UC Davis. As we walked through the vineyard, Mark told me that he farms organically, though it’s not certified. There is no tilling, just mowing the ground cover, and no use of herbicides or pesticides. The site is at an elevation of around 2,800 feet, with warm days and cool nights throughout the growing season. Winds blowing down the vineyard slope help to keep any mildew pressure down. The volcanic soil is rocky, and I could see a number of large rocks poking out from the ground cover. Mark showed me the various grape varieties in the vineyard. He pointed out that the Cabernet Franc vines are more vigorous than the adjacent Viognier vines. He also mentioned that there were grafting issues early on with the Cabernet Sauvignon and that they had to replace many vines, but once the grafts took the variety has done well there. The Petite Sirah is planted at the lower end of vineyard. Mark prunes the vines to delay budbreak as a protection from frost damage, which can be an issue many years. Budbreak generally does not occur until April, and sometimes even as late as early May, with harvest coming in late September and early October. The vines require drip irrigation during the height of the warm growing season, generally getting some water every 8-10 days. Mark noted that their water supply at the property is very good, with a ditch from a nearby creek feeding their irrigation pond. Mark makes the Cedar Crest wines in small lots, and most bottlings are 150 cases or fewer. Whites are fermented in temperature-controlled tanks and aged on the lees. Reds typically undergo an extended maceration prior to pressing. Red wines are aged from about 14-20 months, using a mix of barrels that approximate one-year old oak. Mark said that he particularly likes barrels from Tonnellerie Nadalié. The wines have been bottled with Zork closures but Mark noted that they will be switching to screwcaps. Total production had been as high as 1,500 cases, but it’s now around 500 cases per year. 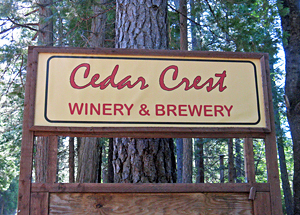 Mark told me that the Cedar Crest winery operations will be moving soon to Redding, and that the weekend event just before my visit might have been the last one at the Manton Valley facility. 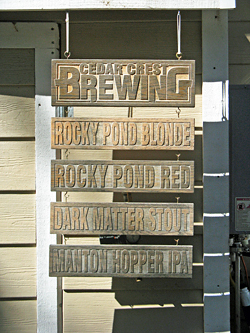 Mark will continue to help farm the vineyard, but much of his time in the past few years has been taken up with another Cedar Crest operation, their brewery. Started in 2014, the brewery business has really taken off, and Mark said that it accounts for about 2/3 of the overall Cedar Crest business now. Mark, who grew up in the Bay Area and now lives in Redding, used to be a home brewer for years. Since there is tasting for both Cedar Crest wines and beer at a location called Enjoy the Store in downtown Red Bluff, both sides of the business will continue, and Mark plans to make around 400 cases of wine per year once the winemaking moves to Redding. As I was talking with Mark, his father Jim stopped by. He’s a fascinating guy who knows a lot about the history of viticulture in Manton Valley, and I learned quite a bit from him. Among the things both Mark and Jim told me was part of the area’s wildfire history. Several wildfires have come close to or gone through part of property over the years, with fires in 2005 and 2012 being particularly destructive in the region. Mark said that the 2012 fire created smoke taint problems for some of their grape varieties, as well as for grapes in many parts of the valley. But he noted that their Viognier was not affected (smoke taint is typically not as big an issue for whites) and neither was their Petite Sirah (due to late veraison for that variety). Mark had some bottles of wine that had been opened at the previous day’s event, and he poured me tastes of a couple of them. In addition to the Cedar Crest wines, Mark has made the wines for nearby Shasta Daisy Vineyard, and some of Cedar Crest’s 2016 and 2017 wines are sourced from their fruit. He also pulled me a barrel sample of Pinot Noir from a different Shasta Daisy site. Mark started me off with the 2014 Estate Viognier – this was made entirely in stainless steel, with no malolactic fermentation. Although the wine was showing some effects of being open for a day, there were still bright stone fruit aromas with herbal and floral undertones, medium weight on the palate with a lively finish. The 2016 Gewürztraminer was sourced from nearby Shasta Daisy Vineyard – like the Viognier, it was made in stainless steel with no malolactic fermentation, and bottled without filtration. Unmistakable Gewürz aromas of lychee and citrus, with floral and spice notes, this was light-medium bodied with a dry, crisp finish, quite nice. Mark briefly went into the winery to pull a barrel sample of 2016 Pinot Noir. The Pinot fruit came from another one of Shasta Daisy’s vineyards, this one a higher, cooler site at about 3,500 feet elevation. Higher-toned plummy fruit, spice, and earth on the nose, with medium weight and firm tannins on the finish, this seemed like it still needs a bit more time to integrate and round out. 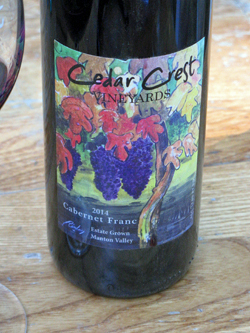 Mark opened one more Cedar Crest wine for me, the 2014 Estate Cabernet Franc. Savory herbal aromas led off, followed by plum and black cherry fruit, spice, earth, and a hint of stony minerals, good structure with a medium-rich mouthfeel and fine tannins – delicious now but should benefit from further cellaring as well. My visit with Mark at Cedar Crest was not unlike some other visits I’ve had in the past with vintners I’d not met before. Mark was somewhat reticent at first but the more we talked, the more he opened up, and before long it seemed like we were old friends. Being able to meet Jim as well was icing on the cake. Although I only tasted a few wines with Mark, I thought a couple of them were standouts – the 2016 Gewürztraminer and in particular, the 2014 Estate Cabernet Franc. Things will be changing at Cedar Crest with the wine production moving from Manton Valley to Redding, and Mark will be kept busy juggling his work at both the winery and brewery. Although it will be sad to lose another Manton Valley tasting room (a couple have closed in recent years), in the long run the move may well be for the best for Mark and Cedar Crest. The Red Bluff tasting location at Enjoy the Store remains open, and for those traveling in the northern part of California, it should be well worth a stop there to taste the Cedar Crest wines. 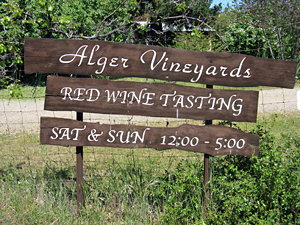 I headed the short distance back down the road from Cedar Crest to my next destination, Alger Vineyards. Since I was in Manton Valley, it made sense to stop at another winery there and Alger had been recommended as a good one to visit. The Alger tasting room is generally open only on weekends so I had contacted owners John & Linda Alger in advance about stopping by on a Monday morning. They had told me that they would be in that day, cleaning up from their “Cinco de Wino” event that had been held at their tasting room the two previous days. I opened the front gate by the road, closing it behind me after I’d gone through, and then followed the signs along the dirt drive to the winery and tasting room. Along the way, I had to stop for a family of Canada geese making their way across the road to the adjacent vineyard pond. Once I arrived at the winery and tasting room buildings, Linda Alger came out to welcome me and led me inside. John and Linda have lived in Manton Valley for 29 years and purchased their vineyard property in 1992, but the vines go back farther than that. 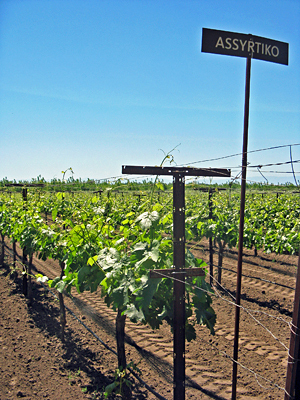 One of the first commercial vineyards planted in the region, there are still Petite Sirah vines there dating from 1971. The vineyard takes up 36 acres of the 61-acre property, and is planted to 14 grape varieties, all of them own-rooted. At about 2,500-foot elevation, the site has rocky and well-drained volcanic soil, and the vineyard is surrounded by old oaks and ponderosa pines. Farming is certified organic with no tilling, and with native vegetation and other plants (rye, vetch, legumes) between the vine rows. John noted that he likes having blackbirds around since they eat many of the grasshoppers and other bugs that can damage the vines and grapes, and that some of the birds will nest on the vine cordons. He also told me that he buys black cinders that had been deposited a nearby volcanic hill, as he feels the bacterial matter from the cinders helps the soil. There’s a six-acre pond on the property, fed by a ditch from nearby Digger Creek. The pond harbors bass, trout, and turtles, and the Canada geese seemed to enjoy it as well! A former engineer, John was born in San Francisco – we found that we had attended the same junior high school there – and an uncle was a horticulture professor at UC Davis. 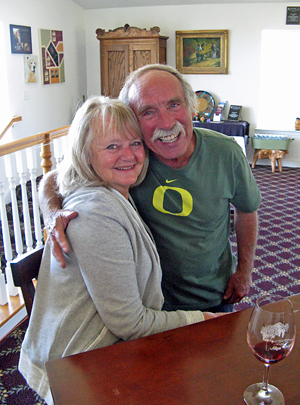 Linda came to the area from Seattle, where she had worked as a counselor for at-risk youth – she handles the events, tasting room and wine club, and administrative side of the Alger wine business, while John heads up the farming and winemaking. John has particular interest in older clones and selections of grape varieties and tends to prefer them to the more recently-introduced clones. In addition to the early Petite Sirah planting on the property, Syrah was also introduced early on, and both are planted with 8x10 spacing, with vine rows oriented a few degrees from north-south. Zinfandel was added in 2000, and there is also Mourvèdre, Cabernet Sauvignon, Malbec, Petit Verdot, Merlot, Pinot Grigio, Viognier, Orange Muscat, and a few other varieties. Much of the Alger fruit went to Fetzer / Bonterra in Mendocino County for many years, and a good deal of their production now goes as bulk wine to Redwood Valley Cellars, run by the Barra family – another noted organic grower in Mendocino County. Like other vineyards in the area, frost is a potential issue every year, and John said that they had more frost damage than usual this year, but it was still a bit early to determine just how bad it was. He prunes on the late side to help delay budbreak. Smoke taint from wildfires can be an issue as well, and he mentioned some of the bad fires that have gone through the area – 1995, 1998, 2002, 2005, and 2012. Though the Algers lost some of their vines in the 2005 fire, the vineyards in the area tend to serve as firebreaks – something that was also noted during the fall 2017 fires in Napa, Sonoma, and Mendocino. 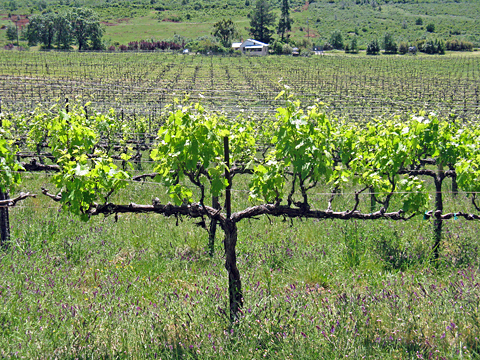 The vines at Alger Vineyard are trained on a two-wire trellis system, with cordon pruning. John and vineyard worker José do just about all of the vineyard work – he described it as a lot of work, but the same as any other hard work. During the warm growing season, John will typically apply drip irrigation to the vines every 8-10 days. 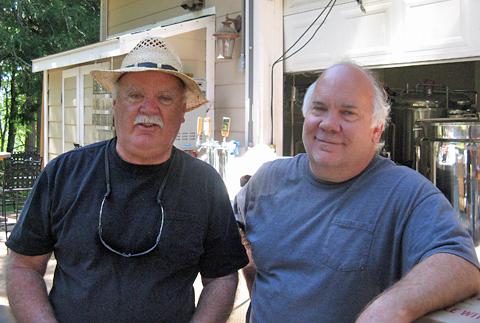 John works with consultant Bob Marr on the winemaking, making the wine in Woodland in the Sacramento Valley. All of the wines are made entirely from estate fruit, in small lots. The reds are destemmed and cold-soaked before inoculation with selected yeasts. Some lots undergo extended maceration prior to pressing, and there is modest use of new oak for the barrel aging. John and Linda poured me a selection of their current releases to taste. We started with the 2012 “Virgin Vine” Zinfandel, which I thought was one of the standouts among the Alger wines. Black pepper, black cherry and red berry fruit, earth, and spice aromas, medium weight with a lively texture and fine tannins – a tasty Zin that brought together the variety’s rustic and elegant sides. Next was the 2014 Malbec – John mentioned that this is 100% Malbec. Another peppery wine, with tobacco / dried herb notes, bright dark berry fruit, and earth, with a moderately rich mouthfeel and fine tannins. We moved on to a few bigger red wines, beginning with the 2012 “Celebration Red,” a blend of Cabernet Sauvignon, Malbec, and a little Merlot. This showed more upfront dark fruit than the first two wines along with touches of pepper and herbs, good acidity and moderate tannins on the finish. The 2014 Cabernet Sauvignon came from three Cabernet clones planted at the estate vineyard – this had distinctly spicy aromas plus herbs, plummy fruit, and a dash of that black pepper quality that seemed to run through every Alger red. Fairly rich mouthfeel with good structure and a grippy tannic finish, this could use more bottle age to help smooth it out a bit. The NV “Lusty Red Dress” was a blend of mostly Petite Sirah (from the 1971 vines) along with Syrah, Zinfandel, and Orange Muscat. The dark-fruited, earthy, peppery, and slightly floral Petite Sirah aromatics were very much in evidence, while this was the most full-bodied of the Alger reds and it finished with firm but not aggressive tannins. We switched from reds to a white blend with the 2016 “Lusty White Dress,” a blend of Viognier, Pinot Gris, and Orange Muscat. Aromas of citrus, orangepeel, and spice, medium-bodied with a lively mouthfeel and a slightly sweet finish. The final wine was the 2007 “Reflection” – this is a Petite Sirah Port-style wine, distilled with Petite Sirah brandy and aged seven years in barrel. This displayed scents of chocolate, dark berry fruit, and spice, with a slightly nutty character, rich mouthfeel with good acidity, and a moderately sweet finish – a nice way to conclude the tasting. When I was trying the last red wine, John asked whether I’d noticed any sign of smoke taint in their two 2012 vintage wines that I’d tasted, since that was one of the bad wildfire years in the area. I had not noticed even the slightest trace of smoke taint, and I tend to be very sensitive to it – a good sign for these wines from a difficult vintage! Alger makes quite a few different bottlings, and ones that I didn’t try during my visit include “Summer Celebration” (Pinot Gris), “Lusty Rosé” (from Zin and Syrah), and “Lusty Blue Dress” (late harvest Syrah). The total production of Alger wines is about 1,200 cases per year, and besides being available through their tasting room and wine club, most wines are distributed only locally, though they are available online as well. After I’d tasted the wines with John and Linda, John offered to give me a short tour of the vineyard, and as I headed back outside the tasting room, I spotted a pleasant-looking patio with tables overlooking the vineyard – a good spot for a picnic lunch. I hopped in to an ATV with John and he drove me around the Alger Vineyard, showing me a number of the different grape varieties including the old Petite Sirah vines. This was a fun visit with John and Linda at Alger Vineyards – they’re both extremely friendly and engaging, and I had a great time there. The Alger wines were straightforward, not overly polished or over-oaked, even a little bit on the rustic side (in the best way), and the black pepper note I picked up in all the reds was intriguing. My favorites of the wines I tasted were the 2012 Zinfandel, 2014 Malbec, and NV “Lusty Red Dress,” and the 2007 “Reflection” was quite good as well. Alger is one of the larger growers in Manton Valley, and their 45+ year-old vines are really a little-known treasure. Manton Valley is a bit out of the way for wine tasting, but if you happen to be in the vicinity of Red Bluff or Lassen National Park, it’s worth the detour to this beautiful area to visit with John and Linda and to taste the Alger wines. After driving back to the Red Bluff area from Manton Valley, I turned south on Highway 99, which runs the length of California’s Central Valley. I passed a few towns along the road before turning off to the small town of Vina, located between the highway and the Sacramento River. 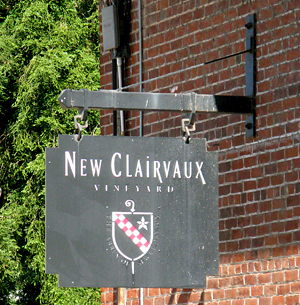 From there, I made my way to the north end of town and the final wine destination of my Northern California wine tour – New Clairvaux Vineyard. 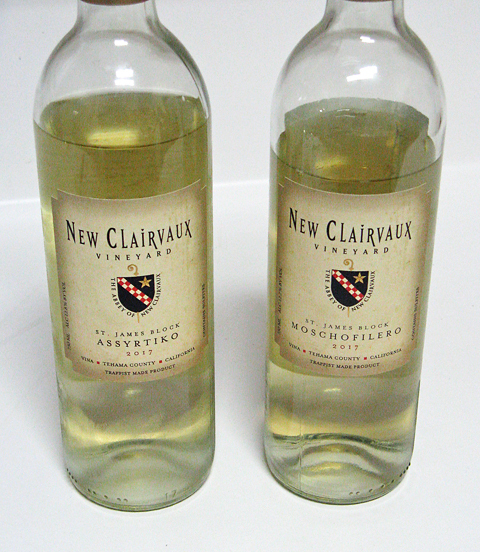 I’d heard about New Clairvaux for a few years, and my interest was heightened in summer 2017 when I read an article on the Sacramento Bee website by wine writer Mike Dunne. He wrote about New Clairvaux’s plantings of two Greek white grape varieties, Assyrtiko and Moschofilero – something I’d never heard of before in California. Since New Clairvaux was right along my route, I contacted winemaker Aimée Sunseri and was able to arrange a visit with her. It was already getting hot when I arrived in the early afternoon, and I was glad to head inside the large brick winery building where Aimée greeted me. Located near the northern end of Sacramento Valley, the vineyard site of New Clairvaux has one of the most fascinating histories in all of California wine, though it’s little-known today. Peter Lassen (for whom Lassen Peak is named) established a small vineyard there with Mission grapevines by the mid-1840s. Henry Gerke purchased the property in the 1850s and brought in other grape varieties, eventually expanding the vineyard to nearly 100 acres. Gerke founded the town of Vina (pronounced “vine-ah”) and built a winery near his vineyard in 1861 – though no longer in use, the building still exists. Located not far from the current winery, Gerke’s structure is the third-oldest winery building in the state – only those at Buena Vista and Charles Krug are older. Railroad tycoon and California governor Leland Stanford – seeing what he thought was great potential for the property – bought the land in 1881 and further enlarged the estate in the following years to over 55,000 acres and the vineyard to nearly 4,000 acres. Plantings included numerous grape varieties for still wines, fortified wines, and brandy production. At the time, “The Great Vina Ranch” was the largest vineyard in the world. Stanford hired engineer Hamden McIntyre (who designed Greystone, Inglenook, Far Niente, Chateau Montelena, and Trefethen wineries in Napa Valley) to design the new winery buildings, some of which still stand. At its height, The Great Vina Ranch was capable of handling two million gallons of wine per year. Unfortunately for Stanford, the venture did not turn out as he’d hoped. Phylloxera and other issues caused problems in the vineyard, and there may well have been difficulties with trying to produce such large volumes of quality wine with the equipment and technology available in the late nineteenth century. Also, the northern Sacramento Valley location was not particularly conducive to making the Bordeaux-style wines that Stanford had envisioned (he initially planted Zinfandel for his claret wines and didn’t add Bordeaux grape varieties until a bit later). Eventually, most of the production went toward brandy rather than wine – the original brick brandy sheds dating from 1887 are still there. After Stanford’s death and with the likelihood of Prohibition on the horizon, the vast property was subdivided and sold off, and the vines were all pulled out. The rebirth of part of this land as a vineyard can be traced back to the 1955 purchase of just under 600 acres in the heart of the old Great Vina Ranch by a group of Trappist-Cistercian monks, to become the Abbey of New Clairvaux. Monks of the Trappist-Cistercian Order follow a path of prayer, austerity, and manual labor, some of which is agricultural. Among other food products, Trappists are renowned for their ales, and the original Cistercians were instrumental in viticulture and winemaking in medieval Burgundy, planting famed Clos de Vougeot in the fourteenth century. There are currently about 20 monks living at New Clairvaux, and in addition to their vineyard, they grow prunes and walnuts at the Abbey property. While the vineyard at New Clairvaux is unlikely to ever rival Clos de Vougeot, it’s a fine achievement nonetheless. The monks strive to be good stewards of the land, and they were aware of its history as a vineyard. Here’s where Aimée and her family step into the story. 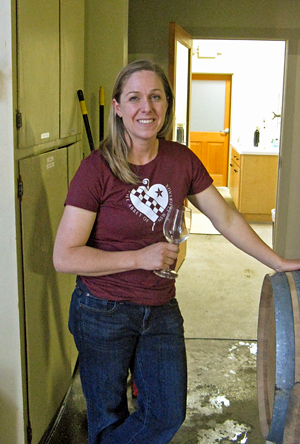 Aimée, who earned a degree in viticulture and enology from UC Davis, is a fifth-generation member of a noted California wine family, the Nichelinis. The family owns Nichelini Family Winery in Napa, which was founded in 1890 – Aimée is the winemaker there as well. 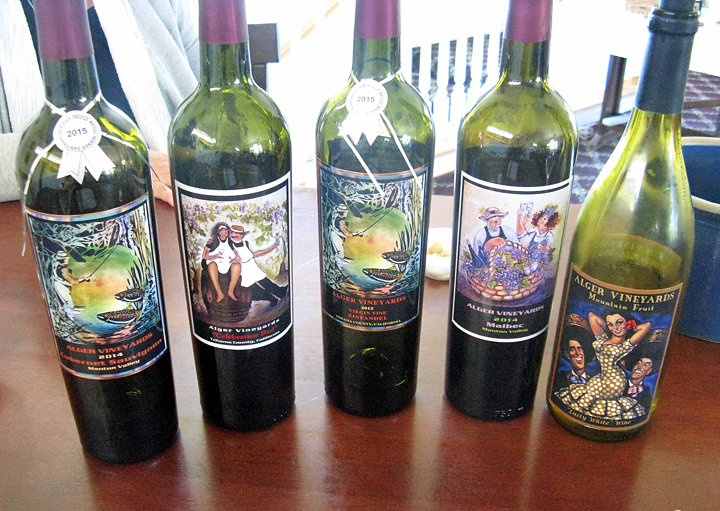 Aimée also has her own label, simply called “Aimée,” with wines made from Napa Valley fruit. Aimée’s father, Phil Sunseri, first spoke with the Abbot of New Clairvaux in the late 1990s about planting a vineyard on their property, and the first vines were planted there in 2000. Along with Phil, Aimée was involved with establishing the vineyard at New Clairvaux. The vineyard at the Abbey – called the St. James Block – was originally three acres and has now grown to ten, with another five-acre site being developed nearby. The St. James Block is farmed by the Abbey’s monks, whose focus is on quality of fruit and sustainability. There is also a second vineyard that provides fruit to New Clairvaux, this one called Poor Souls – it’s a 15-acre site that’s about five miles east of the Abbey, and which is owned and farmed by the Sunseri family. This vineyard is named for the poor souls who have had to plant and farm the difficult site, part of a rocky old creekbed near Deer Creek. In contrast, the soil at the St. James Block is deep, alluvial sandy loam, and Aimée told me that one of the challenges there is to control the vines’ vigor. Another distinction between the two vineyard sites is that Poor Souls has drip irrigation, while St. James Block is dry-farmed (though the vines were irrigated when they were being established). Dry-farming at that location seems remarkable given the very hot weather typical during the growing season there. Aimée also noted that this will be the second year of an organic farming regimen at St. James Block. Between the two vineyard sites, a total of 12 grape varieties are grown. Aimée told me that the choice of varieties was based on those that they expected could do well in the hot climate, and particularly ones that would retain their acidity. Aimée led me from the winery building to the St. James Block to look at some of the vines there. Not surprisingly, the vine and cluster development was significantly farther along than what I saw in Manton Valley earlier that day. Rows of Viognier and Albariño were the first ones we looked at, and then we walked over to where the Assyrtiko and Moschofilero are planted. Other varieties there include Muscat Blanc, Muscat of Alexandria, Trebbiano, Graciano, and Tempranillo, while the Poor Souls site includes Barbera, Petite Sirah, Tannat, Graciano, Tempranillo, and Grenache. Aimée said that they have experimented with different varieties and zeroed in on those that provided good quality fruit. They also made an effort to work with some of the varieties that had been grown at The Great Vina Ranch in the 1880s – Trebbiano is one of those, and they had initially planted some Zinfandel but found that didn’t work out. Harvest at New Clairvaux usually starts in late July to early August and finishes around mid-September. This early harvest works out well for Aimée since most of the crush work there is done by the time harvest for Nichelini in Napa is ready to start. Aimée noted that the timing for picks at New Clairvaux is critical due to the heat in that area during the summer, and even missing by one day can make a big difference. She told me that the pick dates are based mainly on acidity, but also for decent potential alcohol for the wines’ texture. Whites may be picked as early as 18 brix. With the large brick winery building available to them, the crush work is all done indoors to avoid the outside heat. The first New Clairvaux wines were made in 2003, and Aimée has made them from the start. Aimée and I walked back to the winery building, and she opened bottles of the latest bottlings of Assyrtiko and Moschofilero in her office / lab. Noted grocer Darrell Corti of Sacramento’s Corti Brothers market had suggested that these might be suitable for the site, and New Clairvaux obtained cuttings from Foundation Plant Services at UC Davis in 2011. Amazingly, these varieties had been available from FPS for over 60 years yet no one before had planted them in a commercial vineyard. The 2017 Assyrtiko featured citrus and apple aromas along with hints of orangepeel and flowers, good acidity and a slightly chalky quality on the finish, quite nice. The 2017 Moschofilero had beautiful yet subtle floral aromatics plus pear and stone fruit notes, with a slightly richer yet still lively mouthfeel, and a clean, fresh finish, very distinctive. Both of these new Greek white grape variety wines were delicious and displayed fine acidity, with modest alcohol too – both under 13% with the Moschofilero at only 12.2%. Aimée showed me the winery building before heading to the tasting room to try a few more wines. The current winery and tasting room occupy part of the original 1887 wine storage cellar – it features two-foot thick brick walls and unusual vaulted brick ceilings, and it’s now powered by solar panels. Annual production these days is considerably less than the two million gallons the facility was originally designed to handle – New Clairvaux makes 7-8,000 cases per year, with another 2,000 cases for the Aimée label. A brief detour from wine here. I mentioned to Aimée during our look around the old winery building that I’m an architect, and she asked whether I wanted to see the new Abbey church – like everything else at New Clairvaux, this has a fascinating history. The property of a former Cistercian monastery in Spain, Santa María de Óvila, had been sold off in pieces in the nineteenth century. William Randolph Hearst bought part of it and had the old chapter house of the monastery dismantled and the stones brought to California, where he intended to re-assemble them at his estate at Wyntoon, in Siskiyou County. Like Stanford’s dream of a great vineyard, Hearst’s plans also fell short, and nothing came of the project using the old stones. He gave the stones to the City of San Francisco, where they sat for years in Golden Gate Park, until retired New Clairvaux Abbot Father Thomas saw them and inquired about them. The 800-year old chapter house stones were brought to New Clairvaux in the 1990s, and the new church there, just completed within the past few years, is partly constructed from them. Aimée and I made our way to the tasting room and she poured me a few current releases from both New Clairvaux and from her own Aimée label. In addition to the wines I tried with Aimée, other New Clairvaux wines include a White Table Wine (blend of Muscadelle, Viognier and Trebbiano), Viognier, Trebbiano, Syrah Rosé, Nouveau Tempranillo (made by carbonic maceration), Tempranillo, “Vino Dolce” (Port-style wine), and Angelica (made from Muscat grapes). Additional Aimée wines include Moscato, Zinfandel, Merlot, and Cabernet Sauvignon. Aimée started me out with three New Clairvaux wines, beginning with the 2017 Albariño, from the St. James Block. This was made entirely in stainless steel, with full malolactic fermentation, coming in at just 12.2% alcohol. Bright apple and stone fruit with touches of flowers, and a slight buttery component, medium-light body with a crisp finish. The NV “Petite Temptation #6” was next – a 50/50 blend of Petite Sirah from Poor Souls Vineyard and Tempranillo from St. James Block. Aromas of dried herb / tobacco, plum and darker fruit, smoke, earth, and a touch of vanilla, this was medium-full bodied with surprisingly tame tannins – a nice “drink now” wine. The 2016 Barbera is 100% varietal, and featured bright red cherry fruit, herbs, and spice notes, with medium acidity and fairly mild tannins on the finish. We continued with three wines from the Aimée label, all sourced from Napa Valley fruit. The Aimée 2016 Sauvignon Blanc had plenty of grapefruit and herb aromas, with a lively texture and finish. Next up was the Aimée 2017 Pinot Grigio – this displayed bright green apple and citrus along with floral and herbal notes, a juicy mouthfeel and clean finish. We finished up with the 2016 Aimée Primitivo – this was bottled in summer 2017, fairly short barrel aging for this variety. Black cherry and wild berry fruit, lots of spice, and vanilla undertones, this was medium weight with moderate tannins. My visit with Aimée at New Clairvaux Vineyard was one of the highlights of my Northern California wine tour, and a great way to finish it up. The history of the site – most of it long-forgotten – is truly fascinating, and the wines were very good across the board. Highlights for me were the New Clairvaux 2017 Assyrtiko, 2017 Moschofilero, and NV “Petite Temptation,” and the Aimée 2017 Pinot Grigio. It may seem surprising at first that wines of such distinction can be made in a climate as hot as Red Bluff typically is during the summer, but the care with which the vineyards are tended and Aimée’s skill at making the wines combine to make it all work amazingly well. Their work adds to the remarkable history of the Vina area. The New Clairvaux tasting room is open daily and is a highly recommended stop if you happen to be in the area. New Clairvaux seems like it’s a long way from the Bay Area, but it’s actually only about a 2½-hour drive so it made sense to head home after my visit there. The drive south on Interstate 5 was a smooth one, and after a short stop along the way to fill up on gas and grab a bite to eat, I made it home in good time. While I like to make return visits to some of my favorite California wine regions and producers, I often enjoy exploring relatively unknown territory even more. There were several areas I visited on this Northern California wine tour that I’d never traveled through at all before. I’m always fascinated by the changes I see in the landscapes I travel through – different landforms, vegetation, geology, and other things – and there was plenty of variation of all sorts along the way on this trip. Wineries and vineyards are widely dispersed in this part of California, where even adjacent areas (Placer and Nevada counties, for example) can display very different character. So it was no surprise that the wine regions in this part of the state were quite distinct – defined by differing soil, altitude, climate, and other factors. It’s tough to operate a small winery (and all of the places I visited were pretty small) in an area that’s not especially known for wine, as is the case in all of the regions I visited on this trip. The relative remoteness of some of the vineyards and wineries – particularly in Manton Valley and Yuba County – makes it even tougher, and a few of the vintners I spoke with specifically mentioned the challenges they face because of this. So perhaps it was not a great surprise to learn of the struggles that number of wineries have faced and continue to face in these areas. Yet the quality of many of the wines I found at the places I visited made it clear that very good wines can be produced throughout the varied regions in this part of California. What will it take for the determined vintners of these areas to succeed and for new ones to join them? That’s a difficult question, and there are so many factors involved – and somewhat different ones in the various distinct regions – that an answer or answers won’t be easy to find. As with any business, finding ways to differentiate yourself can be a big help. I talked with vintners making wines from varieties that are unusual in their region (Montoliva, New Clairvaux), vintners taking a distinctly non-interventionist path in viticulture and winemaking (Clos Saron, Frenchtown Farms, La Onda), and vintners working in an unusual growing area (Cedar Crest and Alger, in the high-altitude volcanic soil of Manton Valley). There are interesting historical backgrounds to the vineyards and the specific winegrowing areas for these producers as well. My Northern California wine tour was a memorable trip, and I enjoyed meeting so many talented and interesting vintners who are determined to succeed in wine regions that are far from the state’s better-known ones. They’re worth seeking out and supporting. As always, thanks to everyone that I visited for being so generous with their time and their wine!